Matthew's Blog at Workshop Heaven: The Eagle Has Landed! Finally! The first pallet of planes arrived today from Quangsheng and I have been busy unpacking and inspecting a sample of each type, taking photos etc. Better than expected - a lot better than expected; I was hoping for a budget alternative to the big three, a compromise that would suit folks with limited funds, something that would need less fettling than a vintage tool and might perhaps appeal to pro-cabinetmakers for rougher jobs like Jack planing. What we have ended up with are a very serious range of tools indeed. My concerns about the irons were completely unfounded, they are beautifully ground, rock hard and take that spine chillingly sharp edge that you only get with properly heat treated carbon steel. 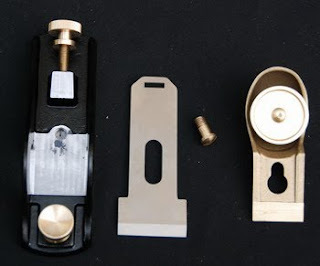 The machining on the bodies is excellent, I stripped a low angle rebating block plane this afternoon and put the sole up against a straight edge – a nice triangle of light between the mouth and the back indicating that the casting had been correctly pre-tensioned as it was ground. After re-inserting the iron and lightly nipping up the cap to working tension (less than half a turn past the point where the blade advance is free enough to work) the triangular gap was gone. It may not sound like much, but getting that just right is a really clever bit of metalworking. I would have absolutely no qualms about putting these tools in front of some of the top cabinetmakers in the country, they really are that good. So, perhaps we had better make that the big FOUR from now on!! !